China, the European Union (EU) and other World Trade Organization (WTO) members have submitted joint proposals on the reform of the WTO's dispute settlement mechanism, known as the Appellate Body, the Ministry of Commerce (MOC) said Thursday. 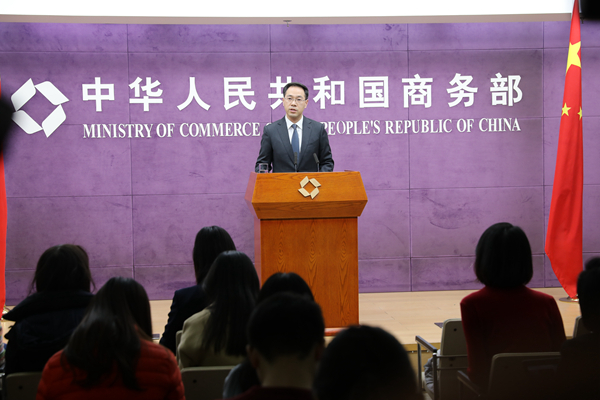 The move is to safeguard and strengthen the independence and impartiality of the Appellate Body and push for the early start of the selection process to fill the vacancies of the Appellate Body, said MOC spokesperson Gao Feng at a press conference. He said China, the EU and other WTO members submitted two joint proposals to the WTO on the reform of WTO's dispute settlement mechanism on Nov. 22, and plan to release a joint statement during the meeting of WTO General Council on Dec. 12. The first proposal gives proper solutions to transitional rules of outgoing Appellate Body members and the second strengthens the independence of the Appellate Body, increases its efficiency and capability and proposes to automatically launch its selection process, said the spokesperson. The proposals aimed to respond to and resolve the concerns of some members over the complaint-filing process, maintain and strengthen the independence and impartiality of the Appellate Body and push for launching the process of selecting Appellate Body members as soon as possible, Gao said. So far, the joint proposals have been signed by more than 40 WTO members, including those from both developed and developing countries. The dispute settlement mechanism is the central pillar of the WTO and plays an important role in maintaining the organization's reliability and predictability, solving trade disputes between members in a short period of time and ensuring its effective functioning, Gao said. The Appellate Body is an important part of the WTO dispute settlement mechanism, Gao said. Obstruction from certain members for selecting members on the Appellate Body "severely threatens the normal operation of the dispute settlement mechanism, posing institutional risks for the normal functioning of the multilateral trade system," Gao said. "China is willing to work together with all other WTO members by holding active discussions to launch the process of selecting Appellate Body members as soon as possible, jointly safeguarding the normal operation of the dispute settlement mechanism and protecting the authoritativeness and effectiveness of the multilateral trade system," Gao added. ​China, the European Union (EU) and other World Trade Organization (WTO) members have submitted joint proposals on the reform of the WTO's dispute settlement mechanism, known as the Appellate Body, the Ministry of Commerce (MOC) said Thursday.